In the Slides panel, select a slide. Right-click the slide, and select Slide Layout. Click Slide Layout icon on the toolbar. Click Format > Slide Layout. 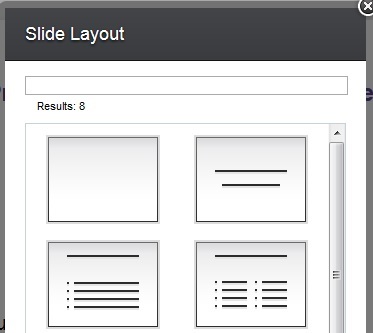 In the Slide Layout window, select a layout. Then, the selected layout is applied to the slide. Note: When you create a new slide after the current slide, the new page follows the same slide layout. But for the Title Slide layout, the new page uses the default layout of title and outline.